What kind of dead baits would you recommend for winter pike fishing? I’ve been trying lots of different baits that you don’t hear of people using and I’ve had some luck on gurnard tail. Thanks for the question William. Fishing for pike with dead baits is a popular method. Before I list my own favourite baits, I want to start by telling a story about the well know and prolific pike angler John Watson. John was giving a slide show at a PAC meeting. The evening was drawing to a close. John had finished his slides and he invited questions from the audience. After answering lots of questions about his own pike angling preferences, someone asked John to name his favourite bait. John simply said, “pike eat fish”. He went on to explain that if you put a fresh bait in front a pike there is a good chance it will pick it up. John’s simple message is a good reminder for all of us. Do not make your pike fishing complicated. Choose baits that are easily available. Supermarkets are a good source of sea fish. Morrison’s seems to be one of the better ones as they usually have the standard choices of Herring, Mackerel, Sardines and Sprats. Most of the good tackle shops stock a selection of frozen baits from one of the main suppliers. 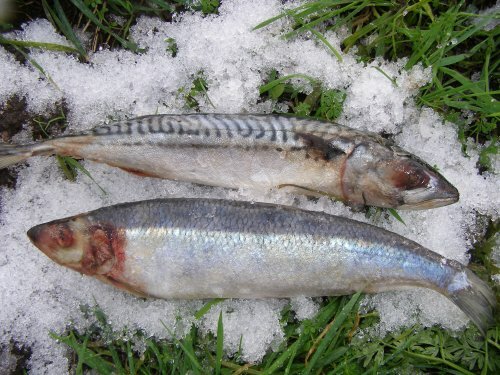 As well as the previously mentioned sea fish you should find Smelt, Joey Mackerel and, more recently, Lamprey and Bluey’s. In addition to sea fish, bait companies also stock a wide range of coarse baits such as Roach, Trout, Bream, Perch and Eels. A confident angler will try harder and persist for longer. Stick to baits that you have confidence in. Use baits that you are happy to put on the hooks and cast into your favourite spots. I guess most pike anglers have tried to use exotic baits at some time. I have even used Red Gurnard… once. Though they are a bit too tough for my liking. I came to the conclusion that unusual baits are not necessary. If you are not sure, just read the angling press to see what others are catching on. I guarantee you will find the usual suspects catch most of the pike. Smelt are a popular bait with a distinctive cucumber smell. They are easy to pop up with air injected into the flanks. Their colour seems to make them stand out in the water. I used to cut Herring in half but now prefer to use them whole. A large whole Herring seems to cut through the jack pike to the larger ladies. I like to slit the Herring’s throat to let the juices flow and fish them tight to the near bank against reeds. I recently started using Bluey’s and found that the pike seem to love them. They are tough enough to stay on the hooks and be recast several times. I also love the silver blue colour and long thin shape which will easily fit into a pike’s mouth. Roach are a tough, resilient bait which makes them very versatile. They will stand up to repeated casting and make a great bait for wobbling. Their tough skin means you can easily make them buoyant by injecting air into the flanks. I have caught too many pike on Mackerel to leave them out of this list. They are very oily, very tough, very heavy and very effective, either fished whole or cut in half. They are a good choice for casting into the distance. Best of luck with your winter dead baiting.